The Southern fried rock band Wet Willie were never as popular as The Allman Brothers Band or Lynyrd Skynyrd but they had success of their own. Keep On Smilin' was their biggest hit and their signature song. Wet Willie was formed in Mobile, AL in 1969 as Fox. They moved to Macon, GA, changed their name to Wet Willie and signed with Phil Walden's Capricorn label which was also the home of The Allman Brothers Band. Jimmy Hall was the lead singer of Wet Willie and he also played harmonica. His brother Jack Hall played bass and sister Donna Hall was one of the background singers The Willettes. Other members were John David Anthony on keyboards, Ricky Hirsch on guitar and Lewis Ross on drums. Wet Willie's first couple of albums didn't do well. But they broke through with the 1974 album Keep On Smilin'. The single Keep On Smilin' reached #10 on the Billboard Hot 100. Some of their other singles charted but Keep On Smilin' was their biggest hit. After five studio albums and two live albums for Capricorn, Wet Willie left for Epic in 1977. 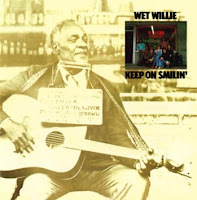 They recorded two unsuccessful albums for Epic and Wet Willie went on hiatus in the early 80s. There are no Wet Willie comps in print right now. But the album Keep On Smilin' is available on CD. Jimmy Hall recorded solo in the 80s. He reformed Wet Willie in the 90s and a version of the band still tours. 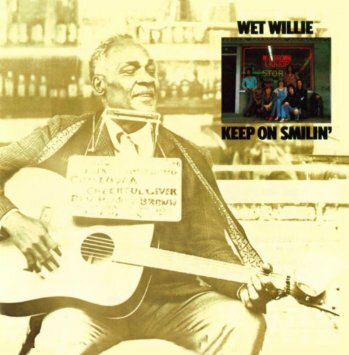 Here's Wet Willie performing Keep On Smilin' at Volunteer Jam IV in Nashville Jan. 14, 1978. I had no idea they were a Southern Rock Band. I did hear their one hit single "Keep On Smiling" a great deal when I was growing up in the 70's. I will have to check them out a bit more. It was good song as I remember.